So you’ve heard that texture’s the latest trend in interior design? However, apart from wallpaper, fabric and tiles, you’re not sure what else there is to it. Well, JB Kind is here to help! “But you’re wooden door specialists,” we hear you query, “what do you know about texture?” Quite a lot as it happens. Not only do we have our own innovative textured door designs, but we’ve also been at the frontline of interior design for the last 30 years, all so that we can be sure to design doors that complement the latest trends. Introducing texture will give any property owner the opportunity to warm up colder, gloomier spaces within their homes. Texture is a beautiful blend of ideas, from the subtle and simple to the brave and creative. Often you almost accidentally introduce texture – take a look around your rooms, can you see textured items already? The chances are you’ll see some of the basics – cushions, curtains or upholstery and perhaps you’ll also see textured accessories like lamp stands, vases, sculptures or wall stickers. The trick with texture is to achieve a balance, to create a combination of different textures across a range of mediums, but beware, don’t be tempted to over texture your home – adding too much texture could leave your rooms looking busy and cluttered, and more worn out than relaxed! A textured favourite is, of course, fabric. Reupholstering furniture with a strong textured fabric is a real winner if you can afford it, or have the skills to do it yourself, however if you don’t why not use some of your favourite material to create an extra layer of fabric to refresh your sofa or chair? The material does not need to cover the whole piece of furniture and can be easily velcroed in place to create a fabulous contrast with your existing sofa or chair’s colours. You can also make use of fabric on your shelving, why not line the inside of (or outside of) your bookshelves with fabric to create a softer space for your books and trinkets? If you’re not confident enough to line the shelves with fabric, then textured wallpaper could also play its part here. Velvet is the number one suggestion to create texture through fabric and is a tried and tested, and a much loved, attribute to any textured room. Curtains and cushions are popular velvet additions – although don’t forget, there are far more textured fabric options out there over and above the range of velvets, take corduroy, leather, and textured fabric patterns for a start! If you’re after some real cutting edge fabrics try James Brindley Fabrics for ideas. Textured patterns, beaded wallpaper and crystal adorned wallpapers are all ways to create a feature wall or a textured wallpaper heaven for the individual design diva (check out examples from designer-leading brand Kandola. If you’ve inherited textured wallpaper that you don’t have the time or money to replace, but you don’t like, then paint the paper to create your own stylish accompaniment to room. Remember the 1970s Anaglypta wallpaper? Well the company is still around and has updated its look with a new contemporary collection of textured treats! Take a look at Anaglypta.co.uk for a taster. Textured wallpaper tends to be used only on one feature wall to avoid the over use of texture in a room. You’ll findsome super examples of unusual textured wallpapers via husband and wife team, Barncroft Room Designs, from textured metallic wallpapers and distressed wood to rustic brick and sand stone! Of course, doors are an exciting design element that we’re a leading authority on! We know that your internal doors are an integral part of your interior design and, happily, we can offer you two of the best door textured designs on the market. Our Ripple doors offer a rippled, textured effect that is perfect for painting so that you can individualise your doors’ colours to your own style theme. 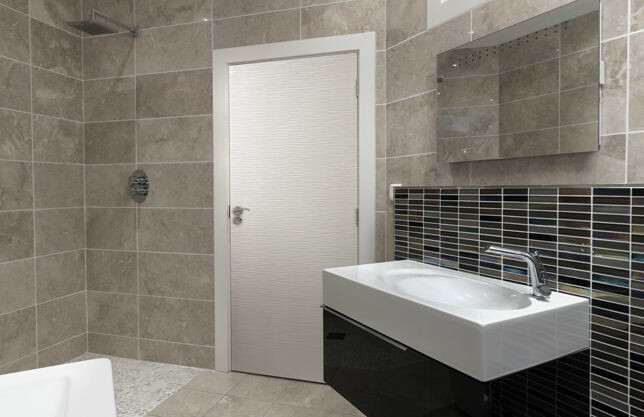 These trendy textured door designs, which include a striking glazed design, enable you to treat yourself, and your guests, to the latest innovation in interior textured doors and create a bespoke property that you can be proud of. Upcycling is a perfect way to introduce texture to your home. If you are integrating new design elements with traditional features you can create attractive pieces of furniture from natural materials, like rustic logs. Take a look at these 40 top tips from Woo Home, you’ll be amazed at what can be created from a tree stump or log – coffee tables, stools and lamp stands are just a few of the inspiring ideas. Refurnishing your old wooden doors is another way to add a unique touch to your home whilst incorporating the much loved texture of timber. From mirrors to chalkboards, to coat hangers and chairs, you will find a multitude of ideas if you Google ‘Upcycling Old Doors’ or read our blog Unique ways to upcycle your doors. You can adorn your home with various textured accessories which entice that irresistible touch of curiosity. There is a textured accessory for every taste and budget on the high street, from striking lamp stands (pineapples are currently very on trend), to funky glass wall art or lusciously soft rugs, you truly are spoilt for choice. If you have a penchant for craft and design, why not create your own textured accessories? Whether you are using bold, striking colours or soft colours in different shades, you’ll be able to layer texture on flatter surfaces and create some stunning end results. For example, 3D wall art, or refurbishing a lampshade are just two winning ways to bring texture into a room. Simply add ribbon or trimming to a plain lampshade to bring a welcome touch of depth and colour. For exclusive trimmings for your lamps (or your walls and curtains), why not check out designers Osborne and Little for some of the best on the market. Give wall stencilling a textured take, by creating a 3D border or mural for your walls to literally make your room stand out. Subtle rises (made with wall filler or papier mache for example) in your stencil designs will ensure your room is a shining example of the current textured trend. After all, this year’s texture trend is all about the detail which means that everyone can make their individual mark and embrace their own individual design style. So whatever your interior inspirations are then take a tip from us, texture is key in a 2016/17 property and is likely to continue well into the future.